Who Saved You? And Where? Remember the Girl for Free? Today's tattoo, while not quite as horrible, is right up that alley. This guy went for double trouble. On the left was supposed to be "Saved by Grace", while on the right "John 3:16" in Hebrew. I can tell you right away that his tattoos say nothing of the sort. The Grace tattoo, however, is far more interesting. See, there isn't always correlation between Hebrew and English word meanings. And so, while "Saved" in English has all sorts of meanings, Hebrew uses different words for save (rescue) and save (put money aside). I bet you can tell which word our victim used. Basically, instead of "Saved by Grace", this tattoo reads along the lines of "Saved by Mercy [in her bank account]". Yeah, "Grace" is wrong too. 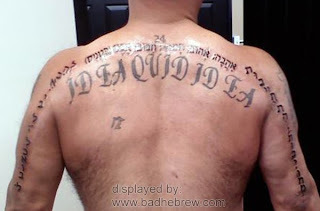 I've warned once or twice about using a dictionary for your Hebrew tattoo, but do people ever listen? To further drive the point in, I proudly present: Dictionary Guy. 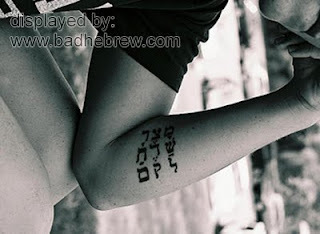 The guy wanted his Hebrew tattoo to say "Love, Commitment, Pain" and looked the words up in a dictionary. He was probably surprised when it turned out to be such a long tattoo. Well, the length should have been a clue. This tattoo has all the possible synonyms of the selected words. It also features creative punctuation and total misunderstanding of the letter Yod. 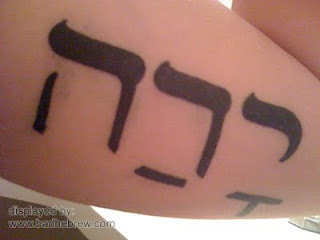 Overall, this Hebrew tattoo is a big, huge, painful mess. This is how you actually write "Love, Commitment, Pain" in Hebrew. Short and sweet. I've written the words with commas between, as it makes much more sense than reading it as a sentence. 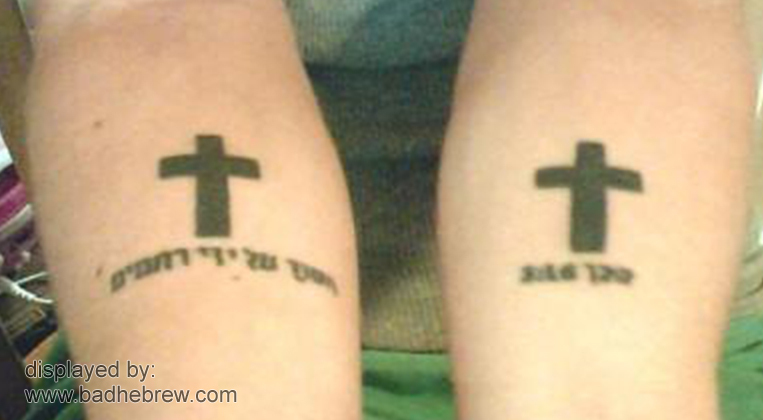 For some, getting a plain old Hebrew tattoo is not enough, they just have to be creative. Check out Puzzle Girl here, can you tell what she was going for? This genius of creativeness got 3 random words, but she couldn't write them right-to-left like normal people, oh no. She wrote them from top to bottom and didn't bother to space the words apart. It looks like one of those how-many-words-can-you-find puzzles, who cares for a game? Curious about her original Hebrew words? Today we have yet another example of Christians making up their own Hebrew words. Remember Tshalach? This one is an apple from the same tree. Of course, "Yadah" doesn't mean anything of the sort. It means either "threw [stones]" or "her hand". It doesn't matter, though, as the tattoo doesn't say "Yadah" - it says "Yarah" which is quite a different word. A word that means "Shot [a gun]" in Hebrew. Oh well, at least now it does have arms in it. Now, see how similar the letters Resh and Dalet are? That's how your "Yadah" turns into a "Yarah". Thinking of getting a Christian spiritual tattoo? Be careful not to end up with incriminating gang ink instead!